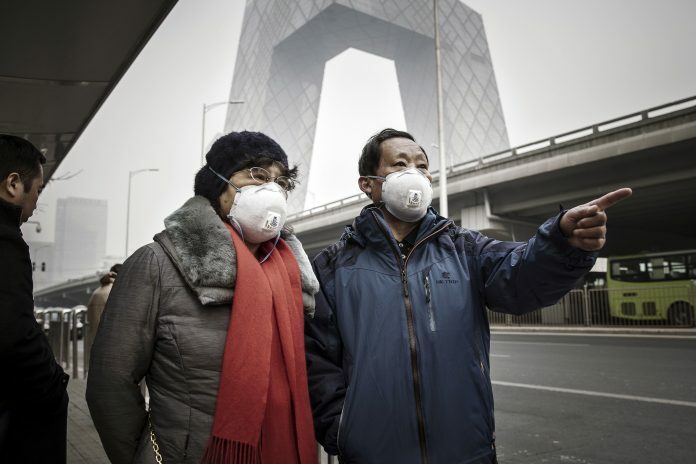 China now releases almost as much carbon dioxide as the US and Europe combined & needs massive investments to fight it. That may not sound like a big rise, but in fact the results will be catastrophic. Already, the world has warmed by 1 degree Celsius since the Industrial Revolution started, and the effects are starting to be apparent — the ice in the Arctic is vanishing, devastating hurricanes like Michael and Maria are becoming more common, and wildfires are gobbling up homes and businesses in California. An additional 3 degrees rise would be far more dire — large parts of major coastal cities would be flooded and become uninhabitable, global food production would be in danger, storms and heat waves would reach epic proportions, and flooding and starvation would create waves of desperate refugees clamoring for entry to the US and Europe. Even a rise of only 1 more degree — which now seems inevitable — will carry serious consequences. The effort required to halt climate change will be intense — essentially, the equivalent of a mobilization for war. The IPCC estimates that in order to limit global warming to the relatively safe level of 1.5 degrees Celsius, the world would need to eliminate coal power and invest $2.4 trillion a year in green energy technologies. That’s is about 3 per cent of global economic output, or 10 per cent of global capital formation. It’s doable, but daunting. The true imbalance is much larger than it appears on this graph. 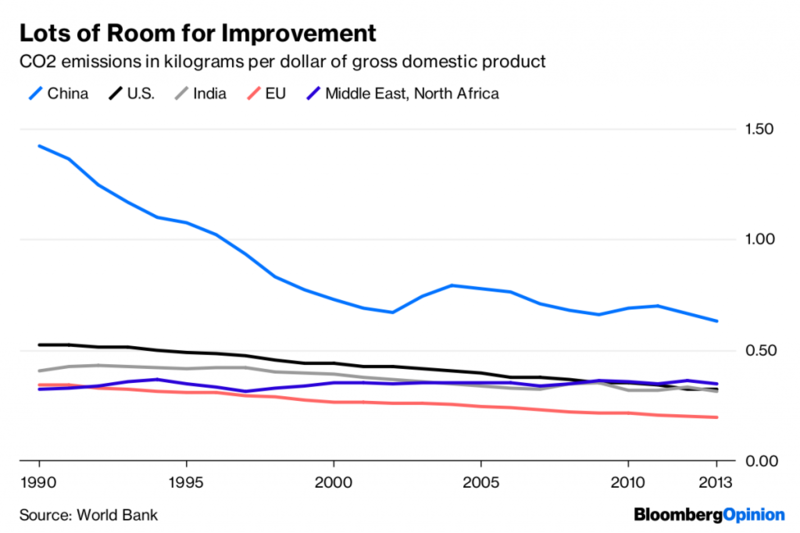 Developed countries grow slowly — perhaps around 2 per cent a year. China, because it’s still catching up, grows much faster, at around 6.5 per cent. That rapid growth is why China’s emissions have soared since 2007, even as the US and Europe have made modest progress. 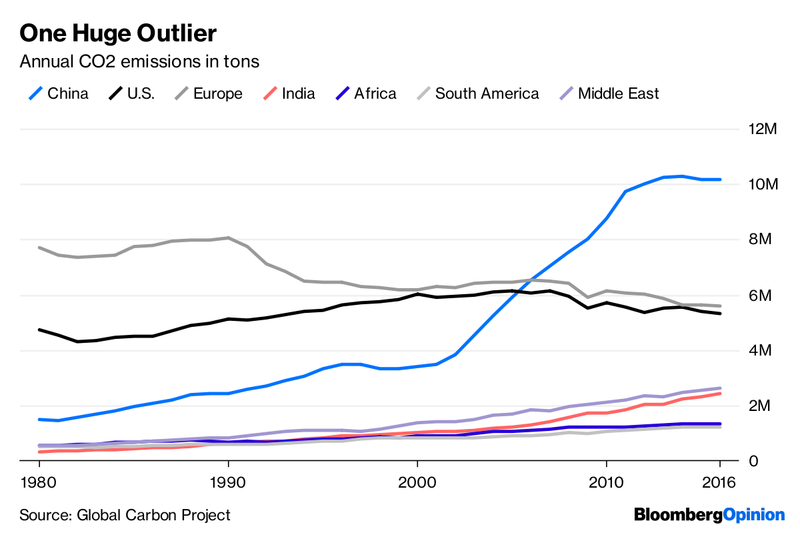 As China continues to catch up, its already enormous share of global emissions will only grow, unless it takes dramatic steps to decarbonize its economy. To its credit, China has made moves to limit coal use. But the country’s emissions continue to rise. This leads to a painful but inescapable truth — no matter how much they spend, no matter how dramatically they change their societies, the US and Europe won’t be able to put much of a dent in global warming on their own. Yes, the US should ban coal power, tax carbon heavily and spend lots of money on building green energy infrastructure. But without a huge change in China, none of that will matter — the battle against climate change will be lost. But retreating into the illusion of control will do nothing to avert the very real threat of environmental doom. Instead, Americans should think about ways that they can encourage China to reduce its carbon emissions. Another potential approach is conditional tariffs on Chinese products. 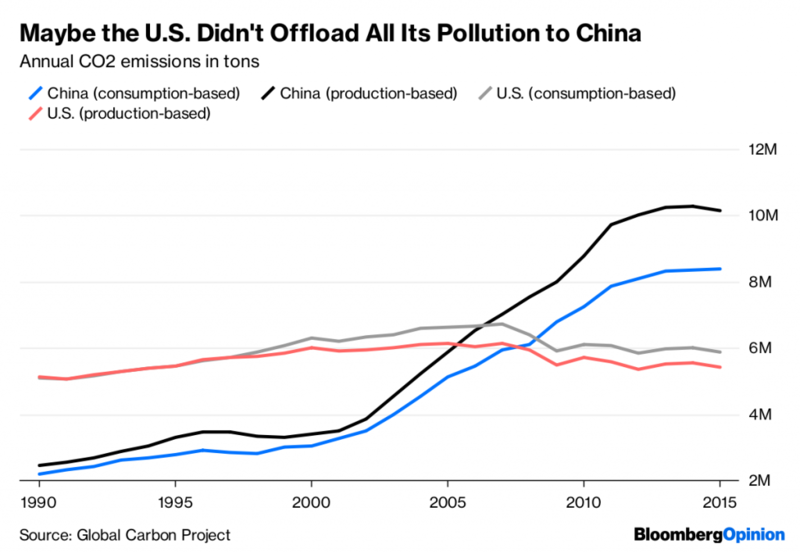 Instead of only taxing the carbon content of Chinese-made goods, the US could threaten to put tariffs on all Chinese products unless it agrees to leave more of its coal permanently in the ground. Banning exports of coal from the US, and heavily subsidizing exports of solar and wind technology, would also help make coal less attractive around the world. Tariffs could also be placed on coal exporters like Australia, Indonesia and Russia, encouraging them to keep their own coal safely underground.